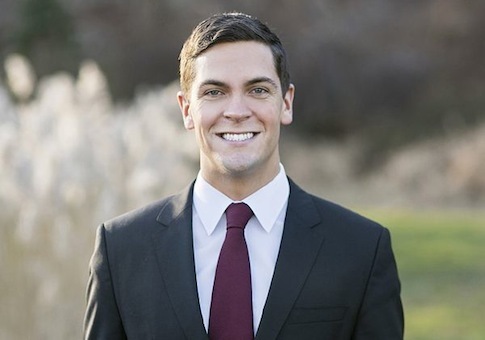 Democrat Sean Eldridge is making large investments in Hudson Valley businesses, but some say his venture capital firm acts as a de facto political operation designed to boost his congressional campaign. Eldridge, the husband of New Republic editor and "poke" button pioneer Chris Hughes, is looking to unseat Rep. Chris Gibson (R., N.Y.). He has dodged allegations since 2011 that he and Hughes moved to New York solely to make him eligible for a House run. Eldridge’s venture capital firm, Hudson River Ventures (HRV), has invested hundreds of thousands of dollars in area businesses since the couple moved to the area in 2011. Those investments are featured prominently in his campaign messaging, leading some to suggest that HRV is, in effect, an extension of Eldridge’s political efforts. Eldridge initially probed a congressional run in New York’s 18th district. When that failed to pan out, he and Hughes moved north, to Shokan, N.Y., where Eldridge declared his candidacy in the 19th district. "It’s a little bit presumptuous," one Shokan resident told the New York Times. "In a community like this you like to know who your neighbors are. Having ties to your neighbors is important. How can he expect to represent people he doesn’t know?" Some see Eldridge’s work at HRV as an effort to ingratiate himself with the community by funding local businesses and academic pursuits. HRV recently put up $500,000 for a new digital fabrication (better known as 3D printing) facility at the State University of New York (SUNY), New Paltz. Eldridge personally donated another $250,000 for the facility, dubbed the Hudson Valley Advanced Manufacturing Center at SUNY New Paltz. Eldridge’s campaign website touts the project as evidence of his commitment to "expand economic opportunity today" by "invest[ing] in the next generation." "The Center is preparing students and workers for the new economy by bringing cutting-edge manufacturing technology—including 3D printing—to the region," the website states. Also backing the center is the Hudson Valley Economic Development Corporation (HVEDC). The group has close ties to Eldridge: Mike Oates, HVEDC’s executive director, left to be the chief executive of HRV in February. Oates was also listed as Eldridge’s campaign treasurer in a statement of organization with the Federal Election Commission in February. Oates appears to be working for both the campaign and HRV. His name continues to appear on FEC filings, and his LinkedIn page says he is currently HRV’s CEO. He has also donated $2,500 to the campaign. Oates also heavily promotes HVEDC’s Eldridge-funded 3D printing project. The project has popped up in various campaign communications. "We're proud that we were able to pull together a dream team of economic development professionals and organizations. Sean Eldridge, Central Hudson, SUNY New Paltz," said HVEDC president and CEO Larry Gottlieb in a May video on the New Paltz facility. Eldridge’s campaign used the same footage of Gottlieb in a campaign video in September designed to bolster his image as an entrepreneur and community-minded New Yorker. Campaign finance reports do not list a payment to HVEDC for the video, nor do they show an in-kind contribution from the group. A source familiar with the race suggested that public relations giant SKDKnickerbocker (SKDK), which boasts both the Eldridge campaign and HRV as clients, may have facilitated the clip’s use in both videos. The campaign has paid SKDK more than $35,000 since March for "media consulting services." The most recent expenditure was on Sept. 12, 10 days before the campaign released the video using footage of Gottlieb. HRV has hired SKDK to "direct attention to his interest in making investments in local businesses," the Times reported. Neither SKDK nor the Eldridge campaign responded to requests for comment. A Republican operative familiar with the race said the synergy between HRV’s activities, SKDK’s work in promoting them, and the central message of Eldridge’s campaign plays into the GOP message in the race. "He is using his money and experience as a big money political player to execute a strategy designed to buy favorable headlines and support to make up for the fact that he has no roots in the district, nothing substantial on his resume, and no ability to relate to middle class families in the Hudson Valley," the operative said in an email. This entry was posted in Politics and tagged Chris Hughes, Sean Eldridge. Bookmark the permalink.